"Socket set" redirects here. For the software program, see SOCET SET. A socket wrench is a type of wrench or spanner that has a socket attached at one end, usually used to turn a fastener. The most prevalent form is the ratcheting socket wrench, often informally called a ratchet. A ratcheting socket wrench is the device within a hand tool in which a metal handle is attached to a ratcheting mechanism, which attaches to a socket. This in turn fits onto a type of bolt or nut. Pulled or pushed in one direction, the ratchet loosens or tightens the bolt or nut attached to the socket. Turned the other direction, the ratchet does not turn the socket but allows the ratchet handle to be re-positioned for another turn while staying attached to the bolt or nut. This ratcheting action allows the fastener to be rapidly tightened or loosened in small increments without disconnecting the tool from the fastener. A switch is built into the ratchet head that allows the user to apply the ratcheting action in either direction, as needed, to tighten or loosen a fastener. Other common methods of driving socket wrenches include pneumatic impact wrenches, hydraulic torque wrenches, torque multipliers and breaker bars. Some lesser known hybrid drivers include striking wrench tools with square drive, and hydraulic impact wrenches (typically powered by on site hydraulic power such as present with military tanks, and many rail car applications). Socket wrenches are most commonly hexagonal, or more commonly referred to as "6-point" in lay terms. Sockets are driven by being attached to the driving tool via a male/female square connection fitting (called the square drive). Standard sizes of square drives around the world include 1/4", 3/8", 1/2", 3/4", 1", 1-1/2", 2-1/2" and 3-1/2" square drive sizes (a de facto international standard with no metric equivalents) along with some lesser used drivers such as 5/8" square drive, and both #4 and #5 spline drives specified in ANSI B107 specifications. This wide range of square drive sizes provides for a wide variety of socket types and sizes to suit small to very large nuts and bolts. Some square drivers have a through hole to attach the socket to the driver (using a retaining ring with o-ring and pin type, or single piece molded retaining rings), a locking pin, or friction ball. Some common hand ratchets employ a quick release button on their top for quick socket release of smaller sockets.The tool chosen to drive the socket wrench ultimately supplies the mechanical advantage needed by the user to provide the torque needed to loosen or tighten the fastener as may be required. Larger drivers are typically used with higher torque, while smaller drivers are used for convenience in smaller low torque applications. Given the limits of human strength and fatigue, torque above 600 ft-lbs of torque will generally involve some kind of power assist, instead of the user simply pushing on the handle of a wrench. Very large sockets and drivers are typically powered by hydraulics to achieve torque. Wrenches in the form of sockets—that is, a female driver to envelop the male head of a fastener—have existed for centuries. Early examples include the keys used to wind clocks since the Middle Ages. The heads and sockets were typically square; hex heads eventually became more common starting in the 20th century. The ratcheting socket wrench, with interchangeable (indexable) sockets, was invented by an American, J.J. Richardson, of Woodstock, Vermont. The tool was patented (Pat. No. 38,914) through the Scientific American Patent Agency on June 16, 1863. The first illustration of the tool appears on p. 248 of the April 16, 1864 issue of Scientific American. In current English usage, the term "socket wrench" connotes indexable sockets so strongly that most English speakers would resist calling a large non-indexable, non-racheting, socket-head wrench a "socket wrench." Square heads and sockets were the easiest to make in the era when hand filing was the typical method of manufacture. With the proliferation of modern manufacturing methods, such as milling, shaping, broaching, and advanced die forging, it became just as easy to make hex heads and sockets as square ones. The hex form allows easier wrenching in confined surroundings (where nearby obstacles obstruct the swing of the wrench), because fewer degrees of arc are needed on each swing before it is possible to reposition the wrench onto the next set of flats. Ratchet wrenches further reduce this problem, as the wrench need only swing as many degrees as it takes for the ratchet pawl to catch the next tooth. Peter 'Pete' Roberts invented the quick release socket wrench. He sold his patent to US retail store chain Sears for $10,000; they said the invention was "worthless." When he learned that Sears had done a market study which revealed a huge market and that they had sold 26 million of his wrenches for a profit of $44 million in the first 10 years, he sued them for fraud. In 1976, a US Federal jury agreed with him and awarded him $1 million in damages. Sears appealed the decision all the way to the US Supreme Court, but lost. In 1982, Roberts was granted $5 million in damages by another jury on the grounds that Sears infringed on his patent, but the judge increased damages to $8.9 million on the grounds that the breach of Roberts' patent was willful. Following the determination by the trial court that Sears had in-fact infringed on Roberts' patent, Sears appealed on the grounds that the patent in question was invalid because it was "obvious" under 35 U.S.C. § 103 and other inventors had already patented similar technology, meaning the PTO should have never issued Roberts' a patent in the first place. The Court noted that simply because others had invented similar types of tools is not proof that Roberts' particular invention is obvious, but instead shows that similar technologies are patentable. The Court held Roberts' patent right was enforceable. wheel brace A non-ratcheting socket wrench where the socket is attached permanently to the end of a L-shaped, or X-shaped bar. They are designed as special use socket wrenches for loosening and tightening lug nuts on automobile or truck wheels. nut driver A screwdriver-type handle for hand turning with a built-in female socket at the end of either metric or fractional inch sizes. May be of different lengths. Saltus wrench Combination wrenches with a fixed socket in place of the box end. T-handle A socket attached to a T-handle that is used for leverage. The socket may be fixed or sliding. tuning wrench Used to tune some musical instruments' strings. spark plug wrench A tube with six-sided sockets on both ends. It is turned with a short length of rod (Tommy bar or T-bar) inserted through two holes in the middle of the tube. The advantages of the system of a ratchet wrench with indexable sockets are speed of wrenching (it is much faster than a conventional wrench, especially in repetitive bolt-on or bolt-off usage) and efficiency of tooling cost and portability (it is much more efficient than a set of non-ratcheting wrenches, with every size head having its own handle). Fine-tooth ratchets have finer teeth on the ratcheting components; these can be useful for tighter locations. Dual-pawl ratchets click twice for each tooth on the gear, effectively doubling the granularity of the mechanism. click-style torque wrench Normally ratcheting and "click" when a preset torque is reached. Some torque wrenches have digital read-outs of torque. Other types of torque wrenches exist such as torque limiting that only allow a preset torque to be reached before they "slip." For some applications, torque multiplying devices are used with a torque wrench. flex-head ratchet Ratchets in which the drive head pivots or swivels back and forth on the handle at a pivot to the rear of the ratchet head. roto-ratchet Ratchets in which the entire ratchet head swivels with handle attachments on the side of the ratcheting head rather than the rear of the ratcheting head. palm ratchet Ratchets with a knurled palm sized circular ratchet handle with reversible socket attachment useful for rapidly loosening or tightening a bolt or nut. They come in a variety of sizes. rotator ratchet Allow the socket to be twisted by twisting the ratchet handle around the handle axis. Requires less than one degree arc swing to rotate socket, which makes them ideal for very tight spaces. gearless ratchet A ratchet that doesn't use gears, but instead uses bearings to provide virtually no arc swing nor produces an audible or discernible click. A number of other specialized ratchets—with hammer heads, multiple drive sizes, and other unusual features—are built by various manufacturers. breaker bar A bar that attaches to a "standard" square recessed socket drive with a ball detent. Breaker bars are usually slightly longer and built more sturdily than a standard ratchet handle and often have a swiveling head that attaches to the socket. Breaker bars are used with a socket of the correct size and type to "break loose" very tight fasteners because their additional length and strength allows the same amount of force to generate significantly more torque than a standard length socket wrench. The use of a breaker bar also prevents potential damage to the ratcheting mechanism of a socket wrench. Once the fastener is "broken loose," it can be turned with a socket wrench or by hand. 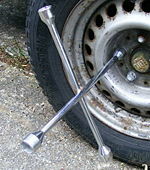 beam-style torque wrench Usually non-ratcheting, made to attach to standard sockets. By monitoring the degree of beam deflection, the applied torque can be determined. speed handle A crank-shaped handle that rapidly loosens or tightens a fastener when used with the correct socket. It works much like a brace and bit adapted to sockets. socket handle A screwdriver handle with a male drive end for attaching sockets. offset drive A fixed drive where the head spins relative to the handle spinning, with the handle having a drive attachment where a ratchet or other socket wrench can be attached. There are also power tool versions of "air" (pneumatic) ratchets which use compressed air power to drive air powered socket wrenches which tighten or loosen nuts or bolts. A second major variety of compressed air powered tools are impact wrenches which are used for common tasks such as lug nuts on wheels. Electric powered impact wrenches for the same tasks are not uncommon. Small cordless 12 volt and 18 volt impact drivers are often used today as powered ratchets to remove and install nuts and bolts. Hydraulic motor ratchets with their characteristic higher torque are rare outside heavy industry. The sockets used for impact duty (called "impact sockets") are made with thicker walls and tempered to a lower hardness so as not to shatter under the impacts of the impact tool. They are typically finished in black oxide rather than the usual chrome plating of the hand-tool variety. Standard sockets (i.e. non-impact sockets) may shatter if used with impact wrenches, presenting a safety risk. There are two main types of socket wrenches: impact sockets and hand sockets. Common sockets are colloquially referred to by counting the number of "points" (pointed corners of walls) present in the shape of the socket nut opening. For example, the hexagon shape is commonly called a "6 point" socket because the hexagon forms 6 "points" where walls intersect to create six sharp pointed corners. This system of description using "points" generally works well in avoiding confusion, with the exception of "8-point" and "12-point" where two very incompatible shapes exist with both having 8 "points" and 12 "points". The vast majority of larger common nut and bolt heads are produced with the 6-point hexagonal gripping shape. Less frequently used shapes include the square 4-point, triple square 12-point (not to be confused with 12-point double hexagon), octagonal 8-point (not to be confused with the more common 8-point double square shape). These less common shapes are typically found in special applications or particular industries such as aircraft, PVC plumbing fittings or German and UK made automobiles. With rail cars, valve adjustment screws and pipe plugs, the 4-point square shaped driver can still be found in wide use both male and female configurations. Nuts and bolt heads are also produced in 12-point double hexagon shapes and various types of splines, more common to aircraft and aerospace applications. Most manufacturers of sockets for larger bolts produce them in 6-point (hexagonal) and limited sizes of 12-point (double-hexagonal) configurations. Male bit drivers are sometimes incorrectly referred to as "sockets", but are in fact the opposite of a socket, in that bit drivers fit into a socket head cap screw or pipe plug, rather than fit over a male drive head on a nut or bolt as a socket does. A socket is a "female" recess or opening which receives another object, together as a fitting connection. A socket is not a protruding "male" connection. Common male bit drivers of this type include Allen hex wrenches (in both metric and fractional inch sizes), Torx (T-3 thru T-50) spline wrenches, 4-point (square), and 12-point (triple square) male bit drivers. Other specialized screw heads that are often installed or removed with screwdriver type handles and appropriate type tip have socket varieties that fit the various screw head types and a can be attached to a socket wrench. Conversely, for low torque situations, a "socket spinner" screwdriver handle with a socket wrench type fitting on one end can be attached to many different types of sockets, bit drivers and extensions. A socket wrench, with the correct type of socket, can be used to loosen or tighten a large variety of fasteners with lower cost, greater ease and often more torque than can be applied with a screwdriver handle. A common use of these different "screw" head type sockets is to attach to power versions of the socket wrenches (impact sockets) which allow the fasteners to be loosened or tightened much faster and more powerfully than can be done by hand. When working with common 6-point hexagonal fasteners, the 12-point shaped socket offers double the number of starting points or possible positions by which to put the socket on the nut. This is of large importance on a box wrench which is typically adjustable in 15 or 30 degree increments. This versatility of fitting position is normally of small importance on a socket wrench which can be easily rotated in small increments regardless of socket type. Since loading contact points between the nut and socket are at the corner points (not the flats), twelve point sockets have more than adequate strength for most applications where nut and socket are in good condition. If the nut or socket is rounded by wear, using a "double" shaped socket is more likely to result in slippage or further rounding off and possible stripping of either the bolt head, nut or socket. This versatility is the main purpose of the 12-point shape found in common sockets, but is essential when working with 12-point bolt and nut heads. Socket strength is mainly a function of the alloys and heat treatments used to make the socket along with wall thickness of the socket wrench as measured at the corner points (thinnest section). Specialized "wobble" or swivel sockets are made, that have a separate socket head and socket wrench connection. This allows the socket to wobble or swivel over a limited range, independent of the socket wrench or tool position, when it is attached to the bolt or nut. This may be a distinct advantage in some applications with restricted access. These "wobble/swivel" sockets, with their typical ball and socket joint swivel attachments, are made in a wide variety of types and sizes including deep, shallow, impact, triple square. They are often found in impact sets since they can be built sturdier than a common universal joint socket. Many socket types and sizes are available with a universal joint between the socket and the ratchet attachment for tightening or loosening fasteners which are not easy to access with the socket wrench, plus standard socket arrangement. Also available are short universal joint extensions that allow any socket to be attached to a ratchet at with a universal joint between the two. Wobble extensions can serve the same purpose and may be easier to use since they often give a more solid socket attachment without all the flexing common to universal joint sockets. Some specialized sockets are made with a specialized "6 flute" etc. socket that attaches to damaged bolts of both metric and fractional inch sizes for removal. Some specialized sockets are made to fit specific specialized applications and are designed and sized for that specific application. Spark plug sockets, oxygen sensor sockets, ball joint sockets, axle nut sockets, etc. fit in this category. Due to the twisting or cam action of the socket on a bolt or nut head, nearly all of the torque is applied at or near the corners of the nut or bolt. Whether one uses either a twelve or six point socket, the same stresses are applied in the same locations. Under load, nearly all of the flats of the nut are not touching the socket at all. It is only a small amount of the surfaces near the fastener corners which bears the torque loads. In nearly all applications over-stressing a bolt or nut will result in stripping the bolt or nut threads or breaking the bolt long before the socket will break. Tougher, thicker impact sockets are made for impact gun use. Occasionally when the corners of a bolt head or nut begin to become worn or damaged, the material the nut is made from can eventually smear or tear under load and create a situation where the corners are effectively "rounded off". Some socket users believe that six point sockets are less likely to damage a fastener head, but tool evaluations and lab tests document that there is no difference in performance. A distorted or corroded fastener head may not fit a six-point socket but a twelve-point socket can be made to fit. When a fastener head is "rounded off" the nut or bolt, it can often no longer be turned without special repair or extraction tools. These rounded-off heads can incur substantial penalties, both direct and indirect. Deteriorated fasteners often inhibit the routine assembly and disassembly of the host components that rely on them, which can in turn deter users from performing normal maintenance procedures. Addressing the problem may require cost and effort, and potentially sidelining valuable equipment until the component's damaged fasteners have been replaced. Over the years, nearly all manufacturers of quality sockets have introduced convex walls and other similar optimizations to the socket geometry in an effort to minimize such problems. These changes are intended to spread the applied torque away from the corners of fasteners and instead target the thicker, more reinforced areas of the nut or bolt head. Successful designs can greatly reduce the likelihood of eroding the vulnerable corner areas of the fastener, with the benefits increasing as the nut or bolt head is subjected to higher and higher loads. Such design modification strategies are typically inexpensive to implement and have been demonstrated to be commercially successful, particularly in the automotive maintenance and repair sector. Spline sockets have a ridge in the center of the side wall and contact the fastener at the approximate midpoint of the side. As a result, these sockets do increase the torque that can be applied without damaging the fastener head and are perhaps the best option for removing frozen or stuck fasteners. An added benefit is that the required tolerance accuracy is minimized, and one socket can correctly fit a wider range of fastener head sizes. Spline sockets are sometimes sold as "universal" sets because the same socket can fit both SAE and metric fastener heads. Many applications use air driven or electric impact wrench or impact driver to deliver the amount of shock and torque required to tighten or loosen the different bolts or nuts in use. Inside an impact wrench there is a rotating hammer, usually driven by electricity or air pressure, that is used to incrementally rotate the output shaft. The impact wrench is designed to deliver high torque output with minimal exertion by the user, by storing energy in a rotating mass, then delivering it suddenly to the output shaft via a hammering action. While typical impact wrenches deliver between 500 and 1500 ft-lbs of torque, some larger impact wrenches such as the Ingersoll Rand 599A1 can deliver near 80,000 ft-lb (10850 Nm) of torque which is enough to tighten hex nuts 7" across flats. Even if the socket attached to the impact wrench does not turn, it is still subjected to successive shock blows by the impact wrench's internal hammer(s). These successive blows are often enough to loosen or tighten a tight or corroded nut or bolt or in some cases break or strip the fastener. Impact wrenches are hard on the sockets since the sockets in use also get hammered. Regular chrome plated "hand sockets" like those commonly included with hand ratchet wrench tool sets are not suitable for this kind of high load impact application. Hand sockets, when used with an impact wrench, can break or shatter explosively if they are used with an impact wrench. Impact sockets are specifically designed and manufactured for impact gun use and are nearly always made from a thicker, tougher and more ductile alloy steel that is then heat treated for extra durability. Most impact sockets made for "standard" hexagonal fasteners have a six-point design. For more flexibility, many impact sockets are made with swivel type socket—socket wrench attachment geometry. These impact sockets are rarely, if ever, chrome-plated, as chrome will chip off under impact use, and the process of chrome plating hardened steel causes some hydrogen embrittlement which can cause parts to crack. Instead, impact sockets are most commonly finished with a black oxide surface or other conversion treatment to provide some corrosion and rust protection and improved appearance even after hard impact wrench use. Although ordinary hand sockets should never be used with impact wrenches, impact sockets can be used with hand socket wrenches and other hand drivers. A set of deep sockets on a rail. Sockets are available in various depths or lengths, often divided by most manufacturers into two categories of "standard" and "deep" according to the ANSI or DIN standard they are made to and the tolerances allowed by those specifications for each length of socket. Because the standards allow for some flexibility in tolerances, it is common to see two manufacturers make deep sockets of the same size but with slightly different depths even though both meet the same specification. Standard length, otherwise known as "shallow" sockets, have a lower profile and allow a user to access nuts in narrow spaces. Deep sockets are useful for turning nuts onto bolts when the bolt extends upwards into the socket (as in the case of many bolted joints), a very typical example being exhaust clamp bolts on a car. Low-profile sockets, shorter even than standard sockets, are available for some applications, typically oil filter removal on engines with limited access. Although most manufacturers offer only those sizes and depths described within the common ANSI or DIN specifications, some exceptions do exist. Specialty manufacturers such as IMPERIAL-Newton Corp offer an expanded range of "extra deep" sockets for special industrial applications; and popular brands like Snap-on or Mac Tools offer what are called "semi-deep" or "mid-length" sockets, which provide much of a deep socket's depth, while fitting in tighter locations. Some sockets are designed to have the same outside diameter and shape within a given set size. Each pass-through socket, within a given socket set, is designed to be used with a "special" ratchet that fits on the outside of the socket and not to the middle of the socket. By fitting the outside of the socket they allow the bolt or stud to extend through the socket, eliminating the need for a deep socket in some applications. By attaching to the outside of the socket they also allow the socket to be built up to 50% shorter and with 20% less width which is an advantage in some situations. Pass-through sockets and ratchets are built for 1/4", 3/8" and 1/2" sets in both SAE and metric sizes. By using a fine tooth ratchet and socket system that allow a pass-through ratchet to be used as a conventional ratchet handle with interchangeable 1/4-inch and 3/8-inch drives some ratchets can be used with standard sockets. They are built by a number of manufacturers with a variety of trade names. Craftsman Tools call theirs Max Axess, and also sells GearWrench's Pass-Thru brands. Lowes calls their socket system Xtreme Access, etc.. Ratcheting box end wrenches can often be employed in the same application, but will nearly always be significantly wider. Extensions, sometimes called "extender arms", attach to a socket on one end and a ratchet on the other end of the extension. These "extend" the length of the socket and allow access to nuts or bolts that are difficult to reach. Extensions are typically 1/2" to 20" in length in roughly 1" to 3" increments. They are sometimes attached together to get a needed length extension, and often have a knurled section for added grip. Wobble extensions have their socket attachment ends ground to allow the socket-extension interface to bend up to about 15 degrees. This additional flexibility often makes using a socket + extension in a cramped location easier. A 1" to 1-1/2" long wobble extension added to the end of any extension will convert it to a slightly longer "wobble" extension. Extension Grip Collars are collars with indents that fit on the back of most extensions preventing it from easily rolling away and allow one to easily grip extension and finger tighten or loosen nuts and bolts by turning extension + socket with or without ratchet. Ratchet spinners are short (about 1-1/2") extensions that have a knurled attachments on them for easy hand tightening or loosening without the ratchet handle. Size adapters allow sockets of one drive size to be used with ratchets of another drive size. They consist of a male drive fitting of one size attached to a female drive fitting of another size. They are typically about 1" long. For example, a 1/4 in. to 3/8 in. adapter allows sockets with 1/4 in. drive holes to attach to a 3/8 in. ratchet, etc..
Universal joints are two articulated socket joints (about 1" long) combined at a right angle, that allow a bend in the turning axis of the wrench and socket. They are used with extensions and ratchets for turning a bolt or nut at a difficult to access location. Wobble extensions may be substituted for some universal joint applications and have the advantage of not wobbling so much. Crows Foot Adapters, sometimes called crowfoot adapters, feature an open end similar to a spanner along with a square hole for a ratchet or breaker bar. They are used to reach otherwise inaccessible fastenings or to hold a tensioning nut at a specific torque whilst allowing access to a locking nut that would be inaccessible with a standard socket. ^ "U.S. Ratchet patent 38914, 1863". Archived from the original on 2008-10-12. Retrieved 2008-05-21. ^ "Improved Wrench". Scientific American. Vol. 10 no. 16. New York: Munn & Co. April 16, 1864. p. 248. Retrieved 2008-07-01. ^ Roberts v. Sears, Roebuck & Co., 573 F.2d 976, 981 (7th Cir. 1978). ^ "Americana: Wrenching Sears". Time. 1978-10-23. ISSN 0040-781X. Archived from the original on 2016-03-11. Retrieved 2019-03-02. ^ "Wrench inventor settles 20-year-old lawsuit with Sears". The Register-Guard. Eugene, Oregon. Associated Press. 1989-09-17. Retrieved 2018-01-03. ^ Roberts v. Sears, Roebuck, & Co., 697 F.2d 796 (7th Cir. 1983).